France is a country famous for its food. The eating of a meal is regarded not only as a necessity but as one of life’s great pleasures. Great care is taken to prepare beautiful food, and then to enjoy it in a leisurely fashion. It is for these reasons that eating out is a popular pastime in France. Although there are plenty of vegetables and beans, the French have a fairly meat-based diet. Beef, chicken, lamb, veal, pork, duck, rabbit, horse, bull and goose are all found in traditional dishes. In general, French cuisine changes with the region. In the north, one may find that food is cooked more richly with butter and cream, and there is a greater use of potatoes and other starches. In the south, one finds simpler dishes cooked in olive oil with tomatoes and garlic. In the southwest, the cuisine is also lighter, with an emphasis on casseroles, cassoulets, white beans, and goose. Generally, the décor of a restaurant is important to the French, and much attention is paid to the atmosphere in the room. Lunch is served from 12:00 to 3:00 p.m., and dinner is served from 7:00 p.m. to around midnight. Those working in offices normally are given an hour for lunch. 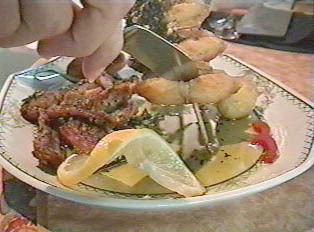 Restaurants generally offer both an à la carte and a set menu. The set menu is the less expensive option and normally includes an appetizer, main course, dessert and choice of beverage. In addition to the many four-star restaurants for which France is famous, there are a wide variety of other dining options. There are both French chains of popular, inexpensive restaurants, as well as many small individually owned restaurants featuring either regional or international cuisine. Among the choices of ethnic food are North African, Spanish, Italian, and Asian cuisines, among others. In addition, restaurants that specialize in seafood are numerous, particularly near the coast. Fast foods have become somewhat popular in France; however, they are more adapted to French culture and include salads and sandwiches that reflect the regional cuisine. Tearooms are nicely decorated rooms that offer light menus such as quiche and sandwiches and are only open for lunch. Brasseries are popular restaurants that have both a café and an eating section. Wine is traditionally consumed with every meal. In restaurants, it can be bought by the bottle or by the carafe called a pichet. It is never considered rude not to drink, and other traditional beverages such a mineral water, juice, soda and coffee are always available. Tipping is an option in France. There are no set rules about the amount, which is left to the diner’s discretion. "May I Book a Table?" "Hello, I'd Like to Reserve a Table"
"Shall We Go to a Bar or a Cafe?" "What Kind of Juices Do You Have?"